Damn, science. Researchers at Tsinghua University in Beijing, China have created a see through eggshell to keep track of how an embryo grows over time. The material is made from a soft, silicon-based organic polymer that maintains the shape of a real eggshell but is completely transparent. 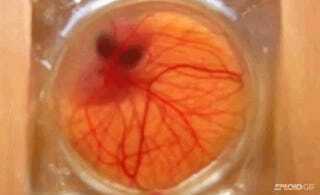 The researchers have so far been able to culture avian embryos in their artificial egg structures for just over 17 days - about three days before they would be expected to hatch. They're hoping one of the practical applications for their new transparent eggs is to allow for blood and other types of organic fluids to be injected inside for early diagnosis, and rare gene variations to be cultured inside.